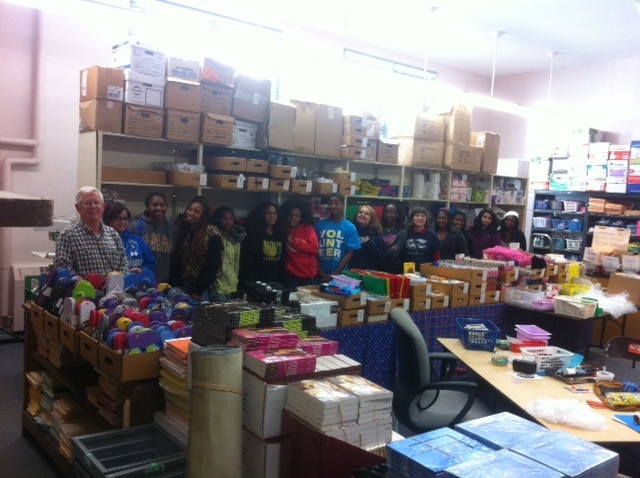 The Teacher Supply Depot Needs High School-aged volunteers YEAR ‘ROUND! Students who need creative hours for the IB program are also welcome. Please wear comfortable work clothes that could get dirty. An emergency contact phone number for anyone under 18 who is not accompanied by an adult will be required. Give Chris Buckley a call or email at the Depot: 904.381.7480, BuckleyC@duvalschools.org. The Teacher Supply Depot is located at 3108 Lenox Avenue. What kinds of things can be found at the Teacher Supply Depot? Most of the items donated to the Teacher Supply Depot were destined for the landfill. Instead of adding to the county’s solid waste disposal difficulties, these materials now end up as creative student projects and innovative teaching aids. Items include art, holiday, office, paper and science supplies; student incentives and children’s books; overruns; punch-outs; end cuts and many other open ended materials. Since its first opening in September of 1996, more than 1,400 contributors donated over $65 million worth of supplies. By the end of the 2015-2016 school year, the Teacher Supply Depot conducted 218 give-away days logging over 69,000 teacher, principal and PTA president visits. The Teacher Supply Depot enjoys tremendous support from the business community, volunteers, the media and the many other individuals who are contributors. This project is a joint effort between the Duval County Public Schools’ Warehousing Division, Community and Family Engagement and the Duval County Council of PTAs/PTSAs. Exit I 10 at McDuff, turn North 1 block and take left on Lenox. Teacher Supply Depot 2 blocks on the left. PTA Presidents or their designee can attend these giveaway dates. You must let them know if you are sending a designee. Do you have supplies to donate? Click the link below for our donation form. The second page of the form includes a list of suggested items to donate. The Teacher Supply Depot has sets of paper cutting dies in many shapes. On this file Ellison Die Inventory there are 3 excel spreadsheets one for each size that are available.